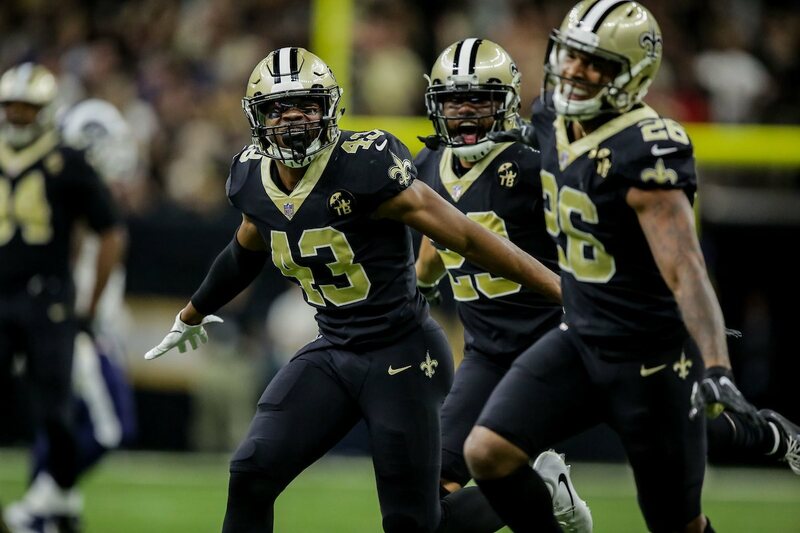 The New Orleans Saints will host the visiting Los Angeles Rams in the 2019 NFC Championship Game this coming Sunday at the Mercedes-Benz Superdome, with the winner advancing to play in Super Bowl LIII (53) in Atlanta, Georgia on February 3rd. Kickoff is at 2:05 p.m. Central time and will be broadcast nationally by FOX. This will be the 76th meeting between the two long-time NFC rivals; with Los Angeles currently leading the series over New Orleans by a tally of (41-34). However as it’s been very well documented: the (14-3) Saints defeated the Rams by a score of 45-35 at the Superdome back in Week #10 (November 4th), and will be seeking to beat L.A. (who also has a 14-3 win-loss record) once again to advance to their 2nd Super Bowl in franchise history. Since that meeting took place, both teams have undergone a transformation with regards to their personnel, which potentially could lead to a much different type of game unfolding this time around. 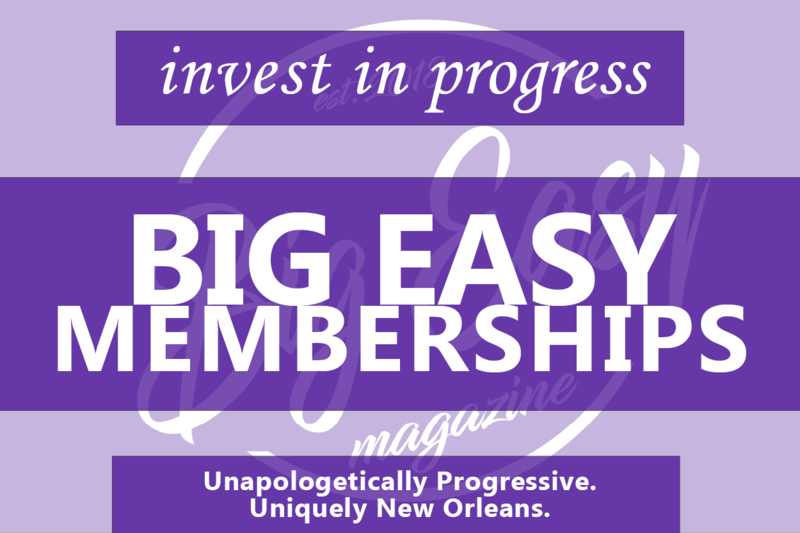 And so, it’s with all of that in mind this morning, that Big Easy Magazine presents our 5 Bold Predictions for this Sunday afternoon’s NFC Championship Game against the Los Angeles Rams, as New Orleans attempts to advance to Super Bowl LIII (53) in Atlanta. As most Saints are likely aware by this point: Saints superstar and 3rd year Michael Thomas virtually owned the Rams secondary when the two teams met previously in early November. He torched them by catching 12 passes for a Saints franchise-record 211 receiving yards along with a “highlight reel” 72-yard TD reception, that ended with Thomas re-creating the famous Joe Horn “flip phone” celebration from the 2004 Season. 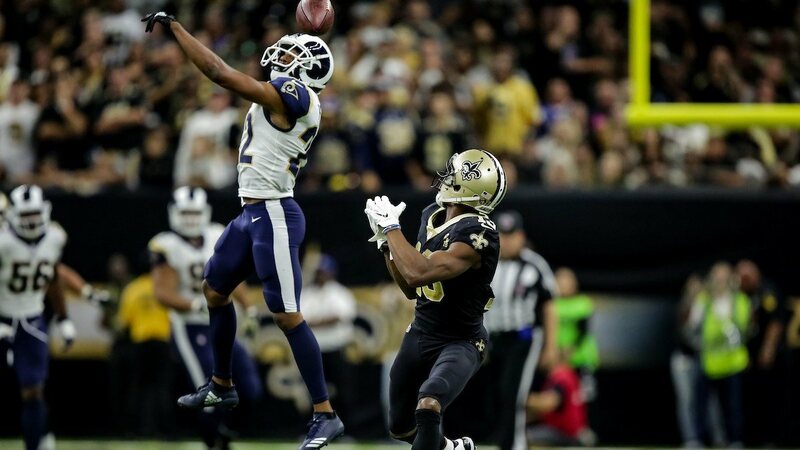 However, most of those gaudy numbers came at the expense of besieged Los Angeles #2 CB Marcus Peters; who had extreme difficulty with keeping up with the much quicker Thomas. In Sunday’s upcoming contest, Thomas won’t have that same luxury, as starting Rams #1 CB Aqib Talib returns to the line-up after he missed the first meeting while recovering on Injured Reserve from ankle surgery. The Rams coaching staff believes that the 32-year old, 11th year veteran Talib will be able to do a much better job at sticking close to Thomas; although it’s important to note that there are several well-known NFL front office people as well as a handful of NFL analysts, who believe Talib is now on the “downside” of his brilliant career. In this Sunday’s game, Talib will become the next NFL CB that “can’t guard Mike” — as Thomas catches 9 passes for 127 receiving yards, along with an incredible TD catch in the 4th Quarter. 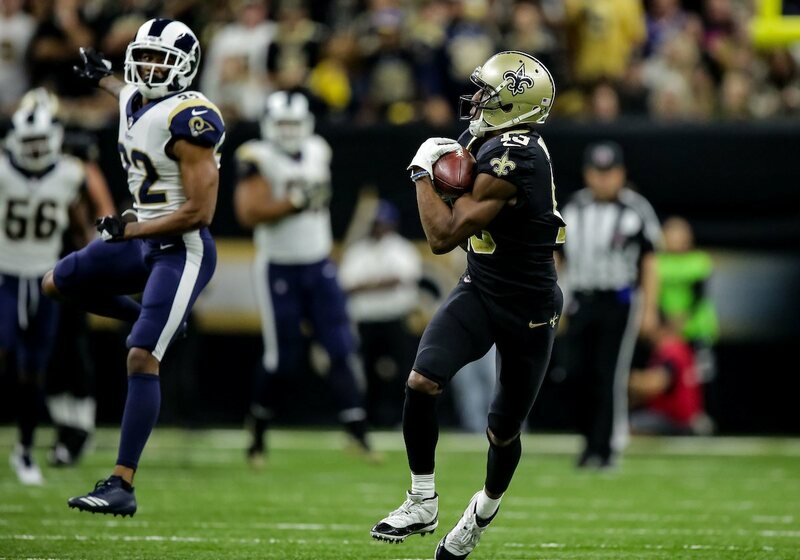 In that first meeting between the two teams back in Week #10 of the recently-completed 2018 NFL Season, New Orleans was able to limit the Rams 92 rushing yards on 19 carries, with Rams All-Pro RB Todd Gurley getting 13 of those carries for 68 yards rushing and a TD. To be fair, however, the Rams at one point in that game were losing by a score of 35-17, which forced them to throw the ball on nearly every play. But the Rams running game quite naturally has evolved from that day, and now might be the most dangerous power-running attack in all of Pro Football, with the addition of former free-agent RB and Denver Broncos star C.J. Anderson. The Rams needed depth after their normal starting #2 RB Malcom Brown, was lost for the remainder of the 2018 Season with a clavicle injury. Since joining their team, Anderson has helped to reinvigorate the Rams power-running attack completely. He has averaged 140 yards per game (a whopping 6.4 yards per carry) in the three games that he’s played in; which including last Sunday’s 30-22 Rams win over the Dallas Cowboys in the Divisional Round; in which Anderson (123 yards) and Gurley (115 yards) combined for an incredible 234 yards as Los Angeles ran for 273 total rushing yards on 43 total carries. On the flip side of things, however: the Saints had the 2nd best run defense in the entire NFL this past season; and they also haven’t allowed an opposing RB to gain over 100 yards in 25 consecutive games. Something has got to give, and in this contest, the tandem of Gurley (75 yards on 11 carries and a TD) and Anderson will (69 yards on 12 carries and a TD) combine for over 100 yards rushing (144 yards); though neither back cracks the 100-yard mark. 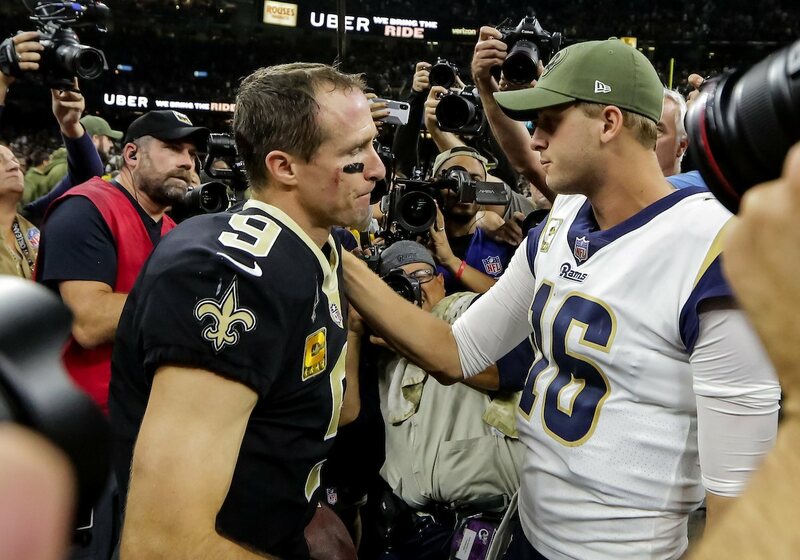 In the 45-35 “shoot out” between the two teams in November, both Saints QB Drew Brees and 3rd year Rams QB Jared Goff each had stellar days throwing the football. Brees lit up the Rams secondary to the tune 25-out-of-36 passes for 346 passing yards and 4 TD’s; while Goff gave the Saints secondary a hard time by completing 28-out-of 40 attempts for nearly 400 passing yards (391) and 4 TD’s along with one interception. Part of the reason why both QB’s were so successful in that contest was that neither player was sacked, and although both were pressured at times, they still had an ample enough amount of time to read the defense and get the ball to an open receiver. Nevertheless, both teams appear to have altered their respective offensive approaches in the Playoffs, with a considerable amount more emphasis placed upon their individual running attacks as opposed to throwing the ball on nearly every single play as they did in that November match-up. That’s precisely why in this contest on Sunday, both players will have a much tougher time throwing the ball; with Brees completing 22-out-of-32 for 276 yards and a TD, while Goff completes 21-out-of 33 attempts for 292 yards with 2 TDs and 1 interception. In their previous meeting, the Saints were able to do an outstanding job at containing Rams 5th year All-Pro DT Aaron Donald, who led the NFL in sacks this past season (20.5). Donald was a unanimous selection for the Associated Press 2018 Season All-Pro Team a couple of days ago, but in that November contest didn’t record any sacks although he was able to generate adequate pressure (4 QB “hits” on Brees and a tackle for loss). What’s worrisome for New Orleans as they head into this Sunday’s match-up is that starting left tackle Andrus Peat has a broken hand that he’s been playing with; which obviously leaves him and the Saints O-line in a very vulnerable position. Peat underwent surgery during the team’s Bye Week two weeks ago, and he played against the Eagles this past weekend in a high degree of pain and discomfort. That broken hand caused Peat to struggle mightily against Eagles DT Fletcher Cox; as he was penalized on four separate occasions for offensive holding. The Saints are expected to compensate by helping Peat double-team Donald, although it’s unclear at this point as to who that might be; given that the other Saints offensive linemen will have their hands more than full with one of the best all-around defensive lines (that also features DT Ndamukong Suh and DE Michael Brockers) in the entire NFL. That doesn’t bode well for the Saints offense and Brees — as Donald “wreaks havoc” with 2 QB sacks along with 5 QB “hits,” 6 QB pressures, a pass batted down, and 5 tackles (2 of them for a loss). Drew Brees finds a wide-open Ted Ginn, Jr. against busted coverage in the Rams secondary, and hits him in stride (unlike last week) for a 52-yard catch-and-run down to the Rams 11-yard line. But the drive stalls; and Saints kicker Wil Lutz’s chip-shot 26-yard field goal ties the score at 24-24 with 7:22 remaining in the game clock. The Rams get the ball back, and methodically drive 76 yards on an 11-play drive that culminates with a 1-yard TD run by Anderson, and the point after gives Los Angeles a 31-24 lead with only 2:19 left remaining in the contest. It’s then that Brees finds a streaking Michael Thomas down the right sideline and heaves the ball towards the goal line. Thomas somehow miraculously pulls the pass in with one hand while being covered by Talib, and falls into the end zone for the game-tying TD, with only: 23 seconds remaining on the clock as the teams appear headed for overtime. However, the Rams aren’t content to merely kneel on the ball and are determined to win the game in regulation. Following a “squib kick” by Lutz, the Rams get the ball at the Saints 33-yard line with 15 seconds showing on the clock. It’s then when Goff finds WR Robert Woods on a slant route against Saints nickel CB P.J. Williams, that takes the ball down to the Saints 40-yard line. The Rams call their final time-out and send kicker Greg Zuerlein out to try a 57-yard field goal to win it, and considering that he kicked a 56-yard field goal against the Black and Gold back in November, all Who Dats can do is watch and pray that he misses it. As the ball is snapped, it quickly appears to have the distance, but the ball hits the right upright of the goal post and falls back harmlessly to the ground, and the 2019 NFC Championship Game is headed for overtime. The Rams win the coin toss and elect to receive the ball first, as they hope to end the game with a winning TD drive. And like clock-work, they matriculate the football down the field until they are faced with 2nd-Down-and-3 yards to go situation at the Saints 42-yard line. As Goff drops back to pass, he floats a pass out into the left flat intended for #1 WR and former Saints WR Brandin Cooks. 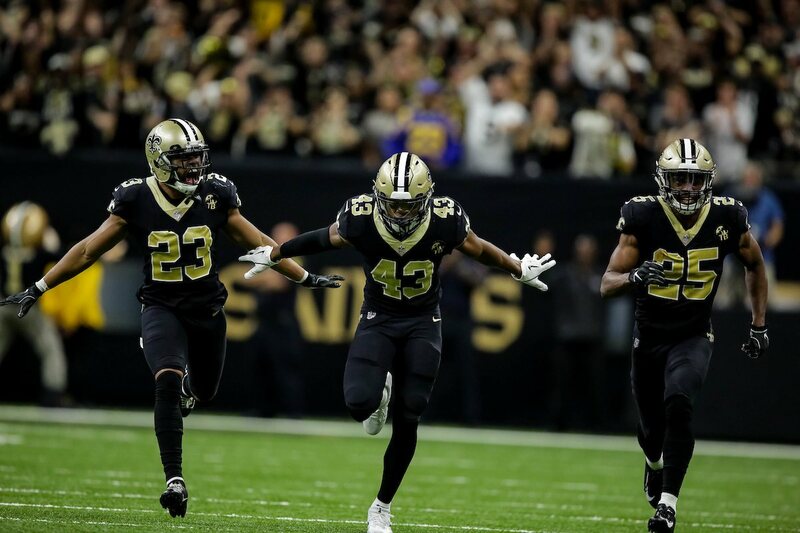 But Goff hasn’t noticed that 2nd-year safety Marcus Williams is in the vicinity to help #1 CB Marshon Lattimore in pass coverage, and he steps in front of Cooks for the “Pick 6” interception as the Superdome home crowd erupts in a state of complete chaos and hysteria. Yeah you right!!! I’ll be watching, hoping, praying and screaming for this outcome!